This is the famous northern Chinese dish, served with mandarin pancakes and hoisin sauce. To learn more, see my feature "Much Ado About Mu Shu." Cut the pork into thin strips. Add the marinade ingredients, adding the cornstarch last. Marinate the pork for 30 minutes. Mix the sauce ingredients, whisking in the cornstarch last. Set aside. Place the dried mushrooms, cloud ears or wood ears, and lily buds in separate bowls and soak for approximately 30 minutes. Remove the stems from the black mushrooms and the hard tips from the lily buds. Cut into thin strips. Rinse the bamboo shoots under warm running water to remove any tinny taste. Drain and cut into thin strips. Clean the green onion and cut into thirds. Cut the ginger into thin strips. Lightly beat the eggs with the salt. Heat the wok over medium-high to high heat. Add 2 tablespoons oil, swirling along the sides. When the oil is hot, add beaten eggs and scramble until they are quite firm. Remove the eggs from the wok. Add 2 tablespoons oil. When the oil is hot, add the ginger and stir-fry until aromatic (about 30 seconds). Stir-fry until the pork changes color and is nearly cooked through. Add 2 tablespoons oil. When the oil is hot, add the wood ears, lily buds, and mushrooms. Stir-fry for about 1 minute. Push up to the sides. Give the sauce a quick re-stir and add in the middle of the wok, stirring quickly to thicken. Add the other pork and scrambled egg back into the pan. Taste and add extra seasoning if desired. Remove from the heat and stir in the sesame oil. To Serve: serve with mandarin crepes and hoisin sauce. Place pancake on a plate and brush with hoisin sauce. Add meat mixture and roll up the pancake. 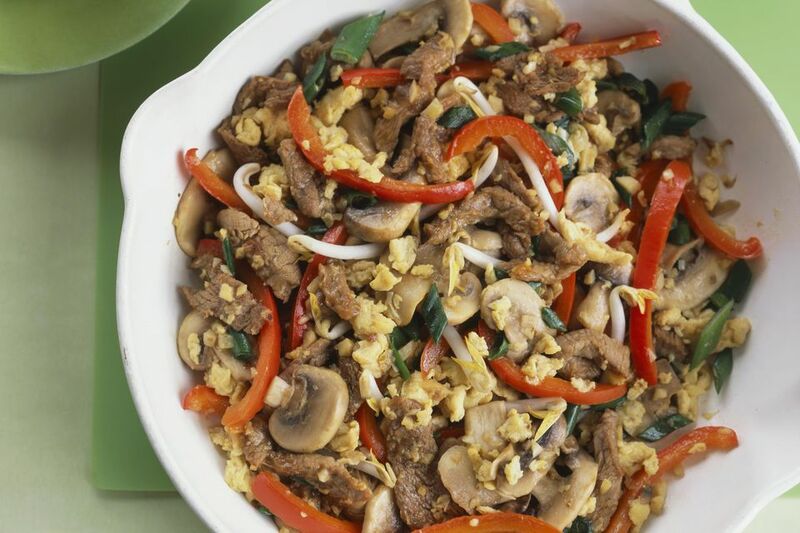 *If desired, instead of stir-frying the green onion you can add it to the meat mixture at this point. Deep-fry the pork instead of stir-frying. Serve the mu shu pork over rice.